Maureen Fan is CEO & Co-Founder of the Emmy award winning and leading VR animation studio Baobab Studios, whose mission is to inspire you to dream by bringing out your sense of wonder. Started by industry leaders Maureen Fan (Zynga VP of Games, Farmville Franchise), Eric Darnell (Director of all 4 Madagascar films), and Larry Cutler (Dreamworks' Head of Character Tech, Pixar TD Toy Story 2, Monsters Inc, Oscar tech judge), the company's Emmy-award winning VR animation, INVASION!, starring Ethan Hawke, launched to substantial critical acclaim and has become the top downloaded VR app. In a first, Hollywood is taking IP from VR to become a feature film: Roth Kirschenbaum Films (Maleficent, Alice in Wonderland, Snow White and the Huntsman) has signed on to adapt INVASION! into a big screen feature film "flattie". Right out of the gate, Baobab Studios garnered laurels from film festivals globally including Sundance Film Festival, Toronto International Film Festival and Cannes. INVASION! is currently a top ranking download on major VR platforms including Oculus, VIVE, PSVR, Samsung, Within, Hulu and others. Baobab’s 2nd VR animation, ASTEROIDS! starring Elizabeth Banks was an official 2017 Sundance Film Festival and Cannes Film Festival selection and won Best VR Experience at the Unity Vision Conference. Their latest Rainbow Crow, starring John Legend, Diego Luna, and Constance Wu premiered at Tribeca Film Festival and Cannes this year. Baobab has raised $31M to date making them one of the largest independent VR studios today. Baobab’s vision is to create experiences with the empathy of film, the agency of games, and ultimately the motivation of real life. Maureen has held leadership roles in film, gaming and the consumer web. 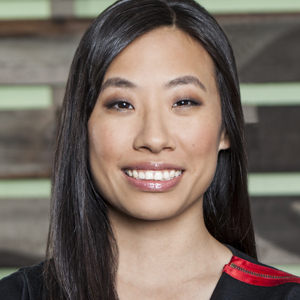 She was most recently vice president of games at Zynga, where she oversaw three game studios including the FarmVille sequel, which contributed to 40 percent of the company’s revenues. Previously, she worked on Pixar's “Toy Story 3” film and at eBay in product management and UI design. Her most recent collaboration, “The Dam Keeper,” directed by Dice Tsutsumi and Robert Kondo, was nominated for the 2015 Oscar Best Animated Short. Maureen was also named one of ‘The Most Creative People of the Year’ by Ad Age for 2016. She received her undergraduate degree in an interdisciplinary program in computer science, art and psychology from Stanford University, graduating Phi Beta Kappa, and earned her master’s degree in business from Harvard University.